I love the smell of coconuts, it always brings me back to summers spent on the beach. Turns out, coconut oils and milks are great for both your skin and your hair. This recipe is a favorite and leaves hair silky and smelling fabulous. Plus, it’s super simple. Pina colada anyone? Pour a can or bottle of unsweetened coconut milk in a bowl and refrigerate overnight so it hardens. 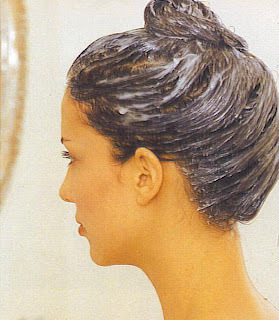 Apply the milk from roots to ends of your dry hair and leave it on for about 20 minutes. Rinse and comb out. If you have dry ends but your scalp tends to get oily, apply this mask only to the bottom 3/4ths of hair, keeping it off the scalp. No need to use all the milk. You can cover the bowl and use again after a few days.